Here is a brief article about implementing "over the horizon" transmissions for television and phone signals. Doing so eliminates numerous relay towers in-between which are not only expensive, but often are difficult to locate due to property acquisition issues. Direct television and multichannel telephone transmission through space for as much as 200 miles - without relay stations and at ultra-high frequencies - is now a reality, according to announcements by Bell Telephone Laboratories and the Massachusetts Institute of Technology. Video and audio information can both be sent "over the horizon" on u.h.f, channels in an extension of a transmission technique recently applied to the continental defense system. Over-the-horizon transmission means that longer communications bridges are possible over water and rugged terrain. In the present microwave radio relay network across the United States, relay stations are only about 30 miles apart. Standard AM radio broadcasting employs waves that follow the earth's curvature. But waves used in television and telephone relays were presumed to travel in a straight line. For many years, "line of sight" transmission between antennas placed on towers on the horizon (about 30 miles apart) was thought to be the only practical means of transmitting by radio the wide bandwidth needed for television and multichannel telephone service. This was disproved after years of research at M. I. T. and Bell Telephone Laboratories. 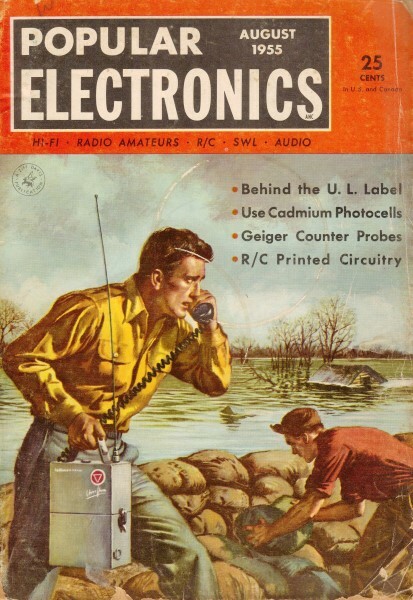 The Bell Laboratories' research stemmed from Bell's success with transcontinental microwave systems for carrying telephone conversations, radio and television programs from coast to coast, and their continued interest in radio propagation. The M. I. T. interest was stimulated by work for the Government in radar and overseas broadcasting. Scientists knew that ultra-high frequencies traveled "over the horizon" under certain conditions but believed them to be too weak and undependable for practical use. In the course of investigating occasional interference attributed to these waves, however, the scientists discovered that many actually overshot the relay towers they were aimed at and arrived at farther points with remarkable consistency. 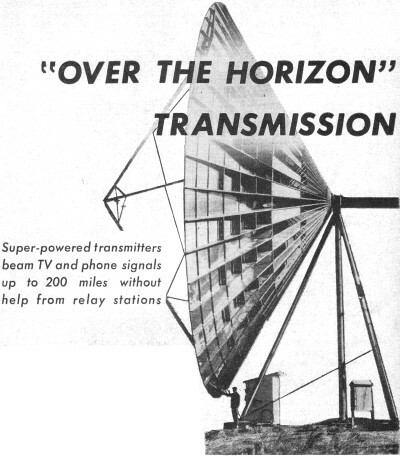 The next step was to provide reliable long-distance transmission "over the horizon." Engineers did this by erecting larger antennas and using higher power than is employed in the conventional microwave system. Thus, they put to use the weaker signals that drop off a straight radio beam beyond the horizon and are reflected or scattered to distant points by the atmosphere. The effect of the new system is very much like that of a powerful searchlight which casts a beam in a straight line. A searchlight aimed at the sky can be seen from the ground miles away, even when the searchlight is behind a hill. This is possible because some of the light is reflected and scattered by the atmosphere. In order to make use of over-the-horizon transmission, 10-kw transmitters and 60'-diameter antennas are being employed, representing 20,000 times the power and 30 times the antenna area used in the present transcontinental microwave system. It was found necessary to employ the lower frequencies (in the u.h.f. band) to develop with available equipment sufficient power to attain a satisfactory degree of reliability. Even after scientists learned that transmission was possible "over the horizon," they were not certain that this medium would support the broad band of frequencies needed for multichannel telephone or television transmission. In the fall of 1953, they found that they could transmit 12 voice channels "over the horizon." Television was first successfully transmitted this way in 1954 between Bell's Holmdel, N. J., laboratory and the M. I. T. Round Hill Research Station near New Bedford, Mass., a distance of 188 miles. Bell and M. I. T. scientists emphasize that this success with over-the-horizon transmission will probably result in a supplement to - rather than a replacement of line-of-sight radio relay systems. Over-the-horizon signals are not to be confused with a similar type of transmission known as "ionospheric scatter," which is useful in long-distance transmission of telegraph signals at relatively low frequencies. Unlike ionospheric signals, the over the-horizon technique provides signals that are useful for the wide bandwidths required for a television picture or by many telephone channels.